Subject : AP PGEC / PGECET- 2015 Admissions, Detailed Notification . 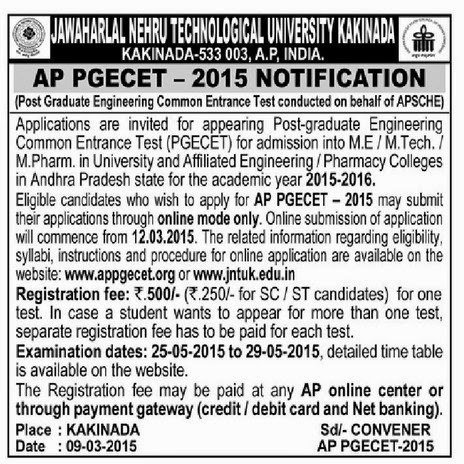 AP PGECET 2015 Notification 2015. The Post Graduate Engineering Common Entrance Test (PGECET) Notification will be published by the officials of JN University of Kakinada, According to the sources last year more than one lack fifty thousand students written the PGECET- 2015 exam. But this year expected to be written the PGECET 2015 exam more than 2 lacks candidates are willing to apply PGECET-2015. The Pgecet 2015 Notification are going to be announced on 27th of this month, with some of the PGECET official website : http://www.appgecet.org , or www.jntuk.edu.in . The JNTUK is going to conduct the PGECET- 2015 Examination and the university has offered the courses like M.E./ M.Tech./ M. Pharm./ M. Arch./ M. Plg. / Graduate level Pharm D. Each and Every Candidate compulsory passed or appeared for the final year of B.E./ B.Tech./ AMIE/ B.Pharmacy/ B.Arch./ B. Planning or equivalent examination. The PGECET 2015 Online Application Registration fee of Rs.500/- for OC / General category candidates and for SC / ST category aspirants must pay the Registration fee as Rs.250/- only. The Registration fee/ late fee may be paid at AP online Centers and also through payment gateways (Credit / debit cards). The sear allotments is depended upon the Vacancies in AU Region, Vacancies in OU Region, Vacancies in SVU Region, and the University wise Course Eligibility, List of Colleges / Courses with Codes, List of Courses with Codes is to be given in the notification.